When it was first published in France in 1961 as Folie et Déraison: Histoire de la Folie à l'âge Classique, few had heard of a thirty-four year old philosopher by the name of Michel Foucault. By the time an abridged English edition was published in 1967 as Madness and Civilization, Michel Foucault had shaken the intellectual world. This translation is the first English edition of the complete French texts of the first and second edition, including all prefaces and appendices, some of them unavailable in the existing French edition. History of Madness begins in the Middle Ages with vivid descriptions of the exclusion and confinement of lepers. Why, Foucault asks, when the leper houses were emptied at the end of the Middle Ages, were they turned into places of confinement for the mad? Why, within the space of several months in 1656, was one out of every hundred people in Paris confined? 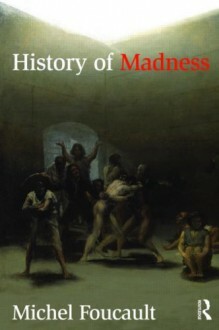 Shifting brilliantly from Descartes and early Enlightenment thought to the founding of the Hôpital Général in Paris and the work of early psychiatrists Philippe Pinel and Samuel Tuke, Foucault focuses throughout, not only on scientific and medical analyses of madness, but also on the philosophical and cultural values attached to the mad. He also urges us to recognize the creative and liberating forces that madness represents, brilliantly drawing on examples from Goya, Nietzsche, Van Gogh and Artaud. The History of Madness is an inspiring and classic work that challenges us to understand madness, reason and power and the forces that shape them.